Do you have trouble sticking to a budget? If so, keeping track of your finances with a monthly budget planner can help you pay off your debt, save money, or simply keep track of your finances. What is a budget printable? 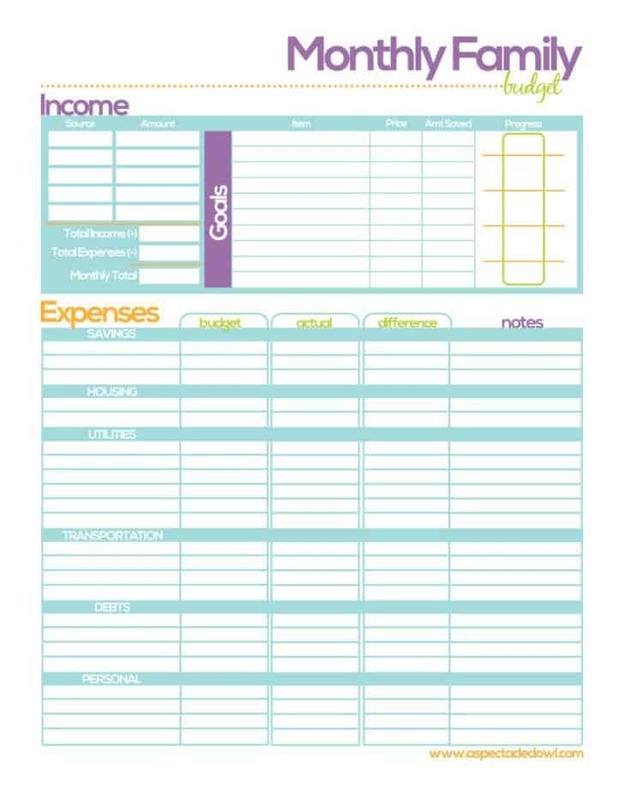 A budget printable is a blank template that keeps you accountable. You enter in all of your spending. At the end of every month, you should look over your monthly spending to see where you can save more. With the #1 printable below, you can even create a savings goal! Why do you need a budget printable? A budget printable will document all of your spending and savings. Without any budget in place, you may end up spending a lot more than you think. Print out your budget printable and stick it to the fridge. It'll help keep yourself accountable! Below are 6 free monthly budget printables that will help you pay off your debt and save money. 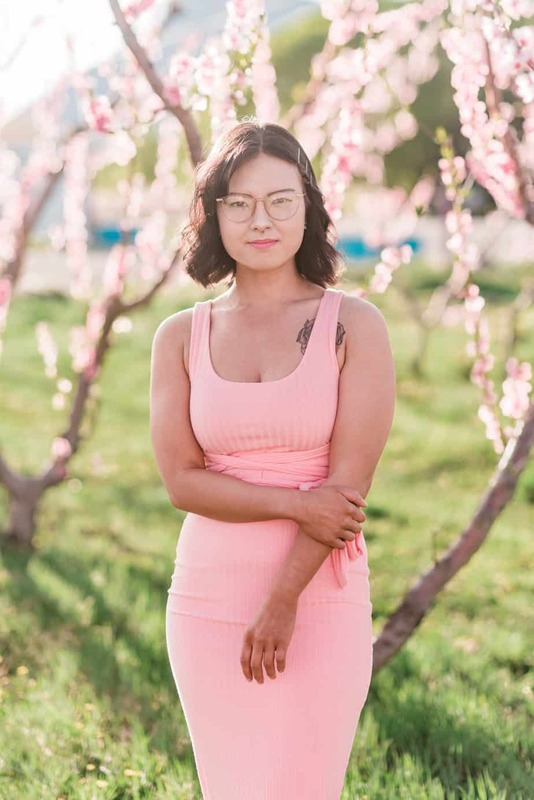 I recently created a free resource library that includes monthly budget planners, meal plan templates, and travel checklists. With this free monthly budget planner, you'll have a section to write down your goal spending and actual spending. You'll be able to keep track of: monthly income, rent, cell phone, utilities, internet, cable/netflix, groceries, credit card, gas, insurance, and more. You even get to create a monthly savings goal, which makes saving money fun! This monthly budget printable will help you keep track of your money, including your savings goals, bills, debt, and more. I especially love the goals section! It's always good to set goals so you have something to work towards. 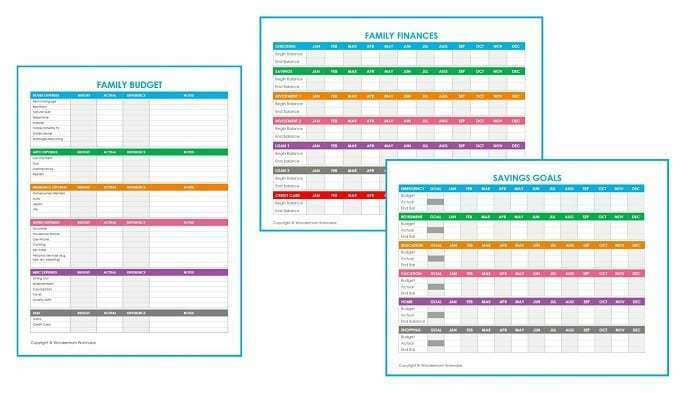 Scattered Squrriels budget planner contains several different sheets to help you control your finances. Included is a monthly bill tracker, debt payment tracker, savings tracker, and spending log. This monthly budget printable comes with an income tracker, bills and fixed expenses tracker, variable expenses, and more. 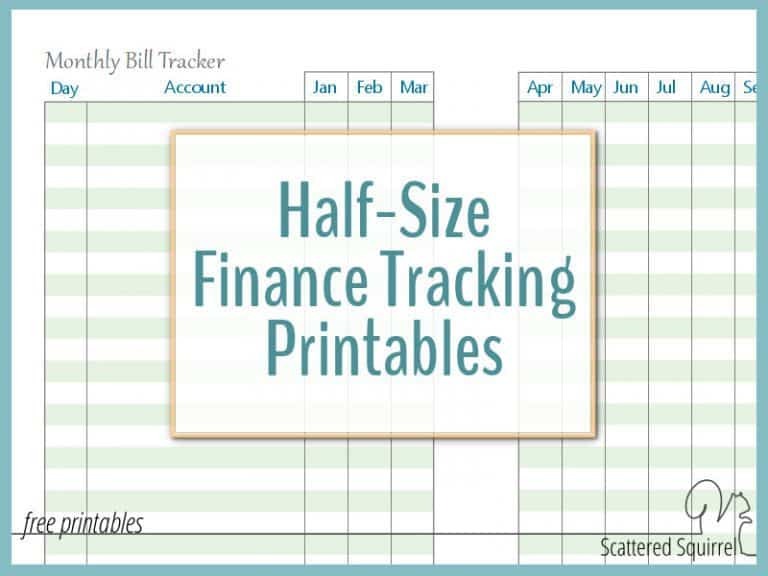 I love that this printable has extra space to add other bills. 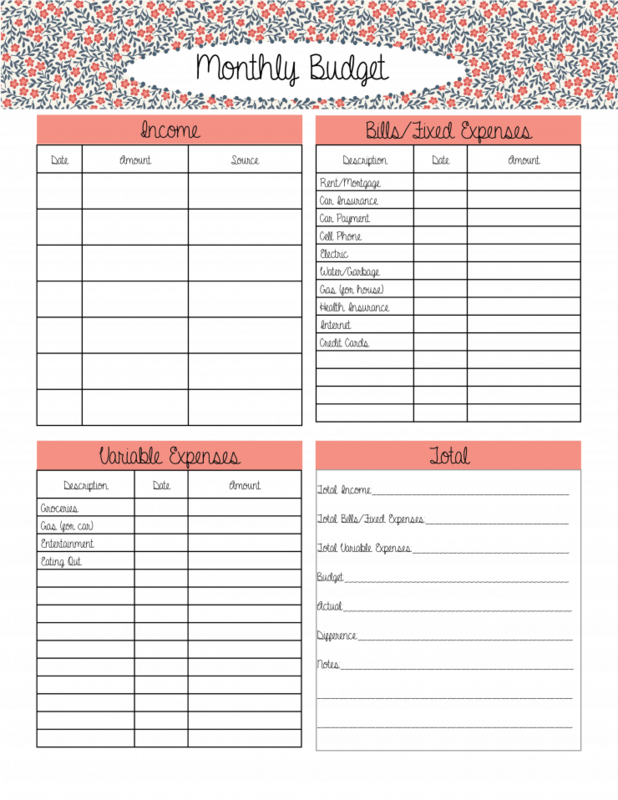 This monthly budget printable can help you keep track of your expenses in a more thorough manner. I also love how this printable has a goals section, and it also lets you track your progress. 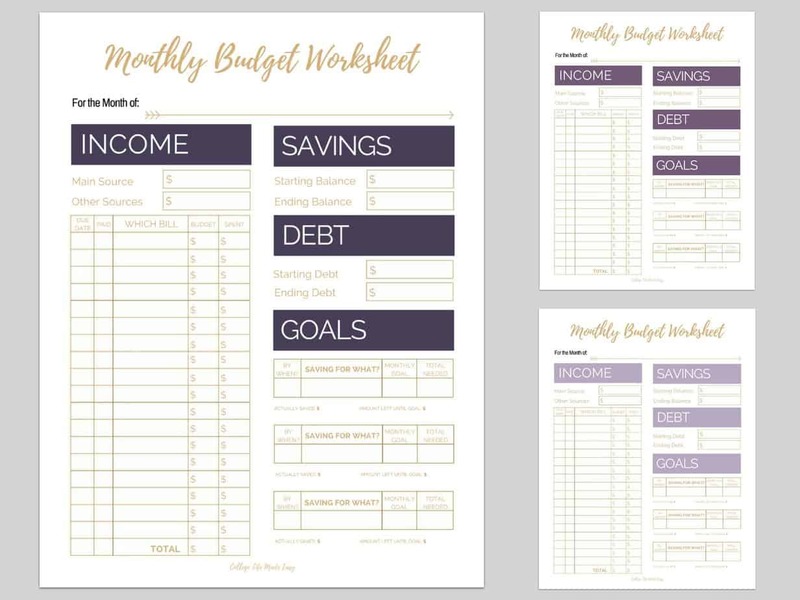 This fun and creative monthly budget printable can help you keep track of your family's budget, finances, and savings goals. It's embarrassing to admit, but I used to hate budgeting. I went years without any budget in my adult life and spent more money than I'd like to admit. That's until I came across EveryDollar. I love using my budget printables, but a budgeting app helps me track my income immediately. All I have to do is conect my bank accounts and set up a job for each and every single dollar each month. Any time I spend, a notification will pop up on the app and I drag the expense into an appropiate category. When you have a written budget in place, it makes it a lot easier to save money and accomplish your goals. Though there are apps and other services that can help you track your spending and savings, there's nothing like the old fashion way of writing your budget down on a piece of paper. Great post, Alexis! Super helpful stuff for sticking to a budget or working towards a financial goal! Love the College Life Made Easy planner and the resources you’ve created! Wow, nice work! I’m checking out Thrive Market too. Hadn’t heard of it, but love it! Thanks!